As a homeowner, you cannot put enough emphasis on the importance of high-quality performing gutters for the well-being of your home. Gutters protect your home from a variety potential pitfalls. First and foremost, gutters move water away from the foundation of your home. This protects your home’s foundation from water, prevents water leaking into your home and protects your landscaping from erosion. Gutters come in two main types – sectional or seamless. Seamless are better quality gutters because they come in a single section based on the length of the roof section. Sectional gutters are fitted together in sections and therefore have a tendency to leak at the points where the sections connect. So the cost of your gutters will depend on sectional vs seamless. We only provide seamless gutter installation because of the quality and performance and overall value they deliver for homeowners. Other factors that affect the cost of gutter installation are the material. 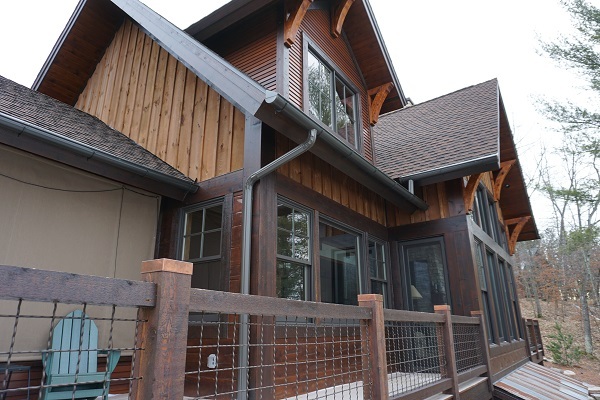 For example, copper gutters are the highest quality gutter material and add an immediate visual impact to your home’s curb appeal. The best way to answer the cost question is to get a free gutter replacement estimate. We’ll come to your home and provide a detailed, written estimate. Another factor to consider when replacing your gutters are gutter guards. The chance to never clean your gutters again is very appealing. We use Valor Gutter Guards which are high-quality gutter guards that use a micro-mesh technology that can handle high water-flow conditions and prevent leaf and other debris from clogging your gutters. When considering new gutters and the overall cost of installing new gutters, you should factor in your time or the cost of hiring someone to clean your gutters. Where Can I Find a Gutter Installer Near Me? With locations in Baxter, Alexandria and Cross Lake, Advantage Seamless Gutters serves a wide radius of Minnesota communities. We’ve helped many Minnesota homeowners with their gutter installation needs. You can check out our gutter projects and reviews (Google, Facebook) online. Having the finest gutters for your home is just a phone call away. Call us at (218) 270-2663 so we can schedule a visit for a free estimate. You can also fill out our online contact form Experience the Advantage today, only here at Advantage Seamless!